We've waited quite some time for Trine to show up on the Playstation Network, and its time has finally come. Nobilis Games has finished the games translation to the PSN, and this Thursday the beautiful 3-player-co-op title Trine will arrive in style. Product Manager for Nobilis, Olivier Vermeille assures us the wait was worth it, and apologizes for the delay. 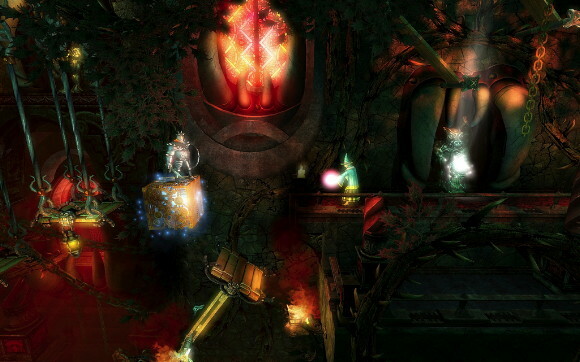 "I realize that many of you have been waiting to get your hands on Trine for some time. I’d like to assure you all that we are deeply sorry about this delay. We worked really hard in order to give you the best experience possible playing Trine and we really hope you’ll enjoy it." October 22nd you will finally get your co-op Trine time from the Playstation Network Store for $19.99, complete with a full set of trophies. Trine has successfully launched on the Euro PSN - a good sign for those that have given up their North American hopes a few times already.